Many Consumer Protection oriented readers know that for the past 5 years, I have been trying to pass legislation to establish a New Mexico Nutrition Council, to advise citizens, schools, and concerned victims of additive poisoning, as well as challenge the FDA when it needs to be challenged. The closest these bills ever came to passing was in 2005. Carried by Navajo Rep. Irvin Harrison, the House Bill passed the House resoundingly, and then hit the Senate Committee on Corporations chaired by Albuquerque Senator Shannon Robinson. Republicans on that committee had already left in a “hissy” fit earlier over some minor miff, and there wasn’t a quorum, so the Democrats there formed a subcommittee and passed it. Committee Chair Robinson, himself a pathetic junk food addict at that time, who was continually strung out on the sugar-candy-cokes-and-god-knows-what-else-he-had eaten highs and lows, the next day did a “floor poll” of the Republicans on his committee, including Minority Leader Stuart Ingle, and convinced them to vote against it. Even though this action was entirely outside of Senate Rules, this killed the bill. I strongly complained to the President of the Senate, Ben Altamirano, who chaired the Ethics Committee. (How I miss his presence in the Legislature: Benny died last Dec. 27). Harrison was reluctant to challenge a Senate Committee Chair; Altamirano told me if a member couldn’t file a formal complaint, that I could do so, which I did; the Vice Chair of Corporations, Bernadette Sanchez, said she would back me up in terms of corroboration, also agreeing he had completely broke Senate Rules. Minority Leader Stuart Ingle apologized, said he was exhausted and had forgotten that he supported the bill, and said he would “make it up to me” the following year, which never happened. Pro Tem President Ben Altamirano had before that session offered to sponsor a Senate version of this Nutrition Council Bill; good planning necessitated having the same bill in both Houses. Ben's sailed through the Senate Committees, passed the Senate 33-1, then was delayed by a staffer on the House Business and Industry Committee, at that time chaired by Fred Luna, whose advancing quasi-senility and manipulation by lobbyists was unavoidable, due to his diabetes and his kidney dialysis. Finally, it was scheduled, and the bill ended up on the House floor on the last day of the Session, when it was killed with about 30 other bills because Representative Dan Foley of Roswell had bludgeoned them all with a stupid filibuster taking up the last two hours of the Session, primarily to kill Majority Leader Kenny Martinez’s Bed Tax on Nursing Homes; Foley used up the precious time left by reading letters from constituents and articles from the Roswell Record. This killed that bill, and others, unfortunately, including the Nutrition Council Bill; none ever came to a final vote. 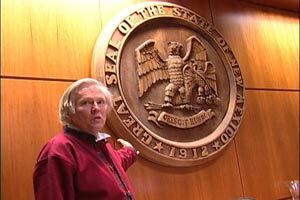 Legislators used to the rules being used to kill legislation could get over this filibuster's damage; I could not, because that had been my only legislative effort, because there was so much at stake in terms of protecting New Mexicans' health, then to see it killed by an ex-Marine right-wing monolith from Roswell, “Filibustering Foley,” who had, in his distinguished legislative career, been arrested for driving over 100 miles an hour in Roswell, and had got in a physical alteration with a school umpire over a call in his son’s basketball game, neither which had bothered his constituents, at least until this election. Foley was confrontational, to say the least, and ruined a lot of people’s legislation with his pre-Neanderthal objections and general “Semper Fi” snarling recalcitrance. So both Shannon Robinson and Dan Foley are now gone, thanks to enlightened voters of Albuquerque and Roswell. At least, Robison got funding for the first (and last) New Mexico International Peace Conference, and the closest his colleagues ever came to complimenting him was to say how well he knew the Senate Rules....Tim Keller beat Robinson with 66.05% of the vote to Robinson’s 33.95%. Foley was bested by Dennis Kintigh, a former FBI agent who clobbered Foley vote wise in Chaves and Otero Counties. I know nothing about their replacements, certainly too little to prognosticate, but I wish them well and I strongly, above all, encourage them to not be like their predecessors. Another welcome demise in the Senate is the replacement of James Taylor of the Albuquerque South Valley by former City Councilor Eric Griego. The vote was 63.71% for Griego and 36.29% for Taylor. Griego has been a major part of some enlightened charities and I am sure will rapidly establish himself as a progressive and indeed creative New Mexico Senator; he was backed by my favorite state Senator, Jerry Ortiz y Pino. I will never forget speaking with two physicians, (Grant La Farge and Kenneth Stoller) plus Senator Jerry Ortiz y Pino to the Senate Public Affairs Committee in 2007 on Jerry’s bill to ban aspartame in New Mexico, and there in the first chair was James Taylor eating a ham sandwich and ostentatiously and contemptuously guzzling his Diet Coke, as if to “dis” those testifying as bringing Internet junk science to the Public Affairs Committee. Visiting his office, as I once did, I saw cases and cases of Diet Cokes in stacks almost to the ceiling, ordered, I presume, because they were free to the legislators. I had to pause and profoundly question what the hell I was doing, trying to convince legislators to look out for New Mexico children, diabetics, Native Americans, the overweight, etc., when in fact, the legislators had terrible addictions to aspartame themselves, so much that they couldn’t be expected to vote intelligently or display any discerning judgment necessary to protect the health of any New Mexican, let alone their own health. I hope Taylor’s neurological demise from the aspartame will not be too ghastly in his later years; he won’t be around the legislature for us to watch any of it. Taylor had been heavily and repeatedly endorsed by Governor Bill Richardson, as had Transportation Committee Chair, Dan Silva. Silva was beaten by Eleanor Chavez, 53.78% to 46.22%. In the larger context, it seemed voters were happy to ignore Pete Domenici’s very late endorsement of Heather Wilson, the Republican whose Congressional career is now over. They ignored Richardson on Taylor and Silva, and in Santa Fe County, they ignored District Attorney Henry Valdez’s endorsement for his Deputy A.J. Salazar when they elected Angela “Spence” Pacheco for D.A. This is a sign of health independence on the part of the voters. And in fairness to Richardson, most of his slate of incumbents was re-elected. As to the Nutrition Council, the mortal damage done to this concept was achieved by some dastardly actions of Shannon Robinson and Dan Foley, and the gaping omissions by James Taylor and a few other Senators continuing as members, whom I choose not to name here. The most curious and hypocritical of them is Senator Dr. Steve Komadina of Corrales, who as an Obstetrician will tell his patients to never ever consumer aspartame, but when it comes to a bill to that effect for all New Mexicans, that would go against his so-called Libertarian principles. What a baffling contradiction!